Despite the increase in the volume of noninvasive tests, echocardiography has significant underutilization nationwide.4 Papolos et al queried the Nationwide Inpatient Sample database for hospital admissions from 2001-2011 and evaluated the use of echocardiography for 5 diagnoses for which echocardiography is appropriate: acute myocardial infarction, cardiac dysrhythmia, acute cerebrovascular disease, congestive heart failure, and coronary artery disease. They found that echocardiography was used in only 8% of cases for these 5 diagnoses, a utilization rate that is significantly lower than expected based on guideline recommendations. Based on Centers for Medicare & Medicaid Services (CMS) quality strategies,5 healthcare is shifting from a volume-based to a value-based system. Value in healthcare is defined as outcomes achieved per dollar spent.6 The focus of cardiovascular imaging still emphasizes volume but can be directed toward a value-based system by promoting optimal utilization rather than absolute volume. Optimal utilization is administration of the right test for the right patient at the right time. Traditionally, outcomes in cardiovascular imaging have been measured by mortality and morbidity. For example, the PROMISE (Prospective Multicenter Imaging Study for Evaluation of Chest Pain) trial randomized 10,003 patients with stable chest pain and a mean pretest likelihood of coronary artery disease of 53% into receiving either functional cardiovascular testing (nuclear stress, stress electrocardiography, or stress echocardiography) or anatomical cardiovascular testing (coronary CTA). Outcomes were measured in terms of mortality and morbidity (myocardial infarction, hospitalization for unstable angina, and major procedural complication).7 During a median follow-up of 25 months, neither strategy was superior to the other in improving clinical outcomes. Furthermore, an insignificant difference was seen in cost effectiveness at 3 years. It becomes evident that imaging does not relate directly to morbidity and mortality, and therefore health outcomes are tough to use as a value endpoint. Measuring traditional outcomes of mortality and morbidity in cardiovascular imaging is challenging because randomized controlled trials of imaging are costly, and imaging is a diagnostic test, not a therapeutic option. A different approach for measuring outcomes is needed because the existing model simply does not apply to diagnostic imaging. Michael E. Porter is a renowned economist, researcher, author, and faculty member at Harvard Business School who has proposed a value-based healthcare delivery model.8 Porter recommends reorganization of institutions into integrated practice units (IPUs) around the patient, with the measurement of outcomes and cost for every patient and bundled payments for the entire care cycle, rather than just a diagnosis. When exploring the value equation, he proposes outcomes beyond just morbidity and mortality. Instead, outcomes are “the full set of health results that matter for the patient's condition.”9 The outcome measures can be ranked in three tiers: Tier 1 describes outcomes of health status achieved or retained, Tier 2 describes outcomes in the process of recovery, and Tier 3 defines outcomes in sustainability of health. This hierarchy offers an alternative approach to defining outcomes that is more applicable to patients and clinicians than just mortality and morbidity. The true measurement of cost is complex and is not included in the current discussion. We have developed and are introducing a novel integration of these principles to improve the value of cardiovascular imaging: creation of a clinical care pathway with the involvement of the patient, referring physicians, and a multimodality cardiovascular (MMC) imager (Figure 1). This construct will allow for a comprehensive measurement of defined outcomes based on the tiers proposed by Porter. Patient-centric disease-specific healthcare model for multispecialty systems. CV, cardiovascular; MMC, multimodality cardiovascular. The cardiovascular imaging care process offers many opportunities to engage patients. The first opportunity for engagement occurs before a test is ordered. Made popular by the Choosing Wisely campaign, educational pamphlets have been created to outline the advantages, risks, and costs of certain procedures.13 These pamphlets empower patients to ask questions about which tests are right for them and to make an informed decision before participating in the test. Four pamphlets have been created for cardiovascular imaging: imaging for heart disease, imaging after a heart procedure, stress test for chest pain, and cardiovascular imaging before surgery. A third opportunity for patient engagement occurs after the test is completed. For example, a cardiac stress test negative for ischemia provides valuable information about blood pressure, exercise capacity, and fitness age. Blaha et al correlated exercise capacity with the risk of myocardial infarction and all-cause mortality. They formulated that fitness-associated biological age is a stronger predictor of events than chronological age and that exercise capacity on a treadmill can be a useful clinical tool for facilitating a discussion of lifestyle changes with the patient.15 Healthcare providers can use all the available information from a negative stress test to engage patients and focus on the National Quality Strategy of promoting effective prevention. During the last 2 decades, the number of imaging modalities available in the cardiovascular imaging field has increased and technologic advances have been achieved in each modality. Even the most well-versed referring physicians have challenges in navigating the optimal utilization of cardiovascular imaging resources through a cycle of care at their institutions. Cardiovascular guidelines supported by evidence-based medicine and expert opinion have been created to guide physicians on diagnostic testing and treatment for a disease. In an effort to reduce overutilization, the AUC delineate appropriate and inappropriate indications for each cardiovascular imaging modality. The referring physician's goal of achieving optimal utilization through the use of guidelines and AUC has thus far not helped define the value of cardiovascular imaging, nor have the AUC measured outcome tiers or cost effectiveness. To highlight this discrepancy, a study at Ochsner evaluated adherence to AUC for inpatient transesophageal echocardiograms (TEEs) during a 3-month period. Unlike at most practices, both cardiologists and noncardiologists order TEEs at Ochsner. While some of the TEEs were inappropriate according to the 2011 AUC criteria,17 56% of those still led to a change in clinical management for the patient. This finding supported the limitations of the AUC alone to define optimal utilization and outcomes. Instead, clinical care pathways that integrate communication and coordination of care, a prioritized aim of the National Quality Strategy, will enable better definition of optimal utilization and improved outcomes. Per Joint Commission guidelines, all patients with newly diagnosed heart failure should receive cardiovascular imaging to evaluate left ventricular systolic function.18 However, findings of the Heart Failure Study showed that 20.9% of patients hospitalized with newly diagnosed heart failure did not undergo any cardiovascular imaging between 14 days before and 180 days after admission.19 This example also illustrates an opportunity to improve coordination of care within a hospital and to use available cardiovascular imaging resources appropriately. Coordination of care among referring providers and optimal utilization of imaging tests will help enhance outcomes in Tier 2 (process of recovery). 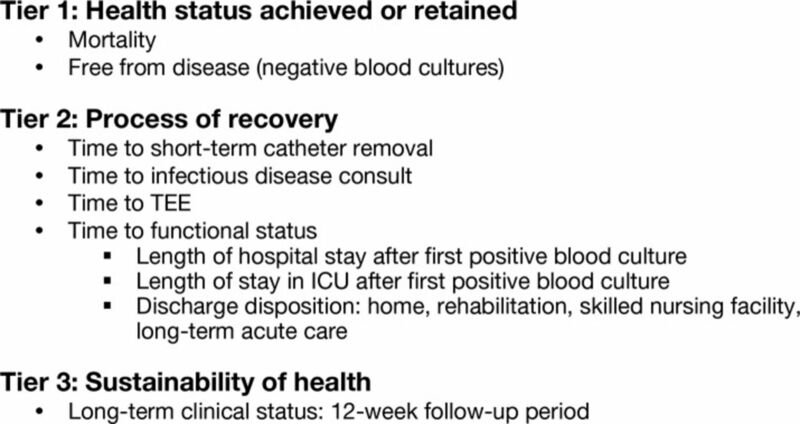 Examples of outcomes in this tier could include time to an appropriate test, time to appropriate treatment, and time to the patient's recovery and return to functional status. Tier 2 outcomes also include complications, reinterventions, and readmissions. An MMC imager is a cardiologist who has specialized in noninvasive diagnostic imaging for nearly 21 months during a 3- to 4-year cardiology fellowship. The MMC imager not only has a sound knowledge of the technologic advances in diagnostic cardiovascular imaging but also a broad understanding of the cardiovascular imaging resources (machines and technicians) at an institution.20 This training and understanding place the MMC imager in the position to create clinical care pathways to optimize resource utilization and define outcomes at a multidisciplinary institution. Cardiovascular imaging is a fraction of the whole system involved in taking care of a patient's particular diagnosis or encounter. One role of the MMC imager is to instill consumer or patient confidence. By explaining the cardiovascular imaging technology used, the experience of the technicians, and the institution's commitment to quality and research, the MMC imager provides facts to instill confidence in the high value and quality of the cardiovascular imaging services provided. In addition to instilling confidence, the MMC imager is also best suited to define the role of cardiovascular imaging in IPUs for every patient's condition by creating clinical care pathways to standardize the appropriate imaging modalities for specific disease processes. 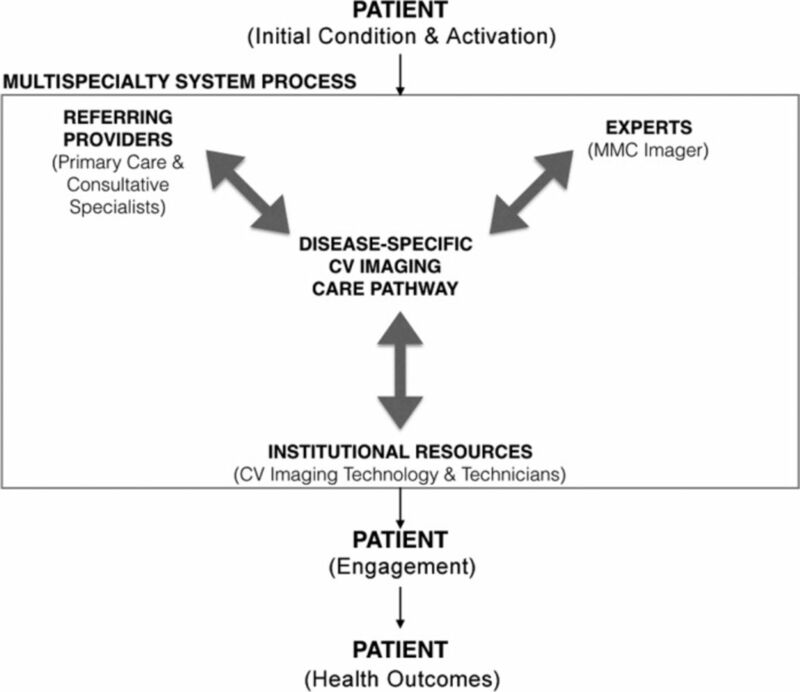 The creation of pathways includes all individuals involved in the care of the patient and the acquisition and interpretation of cardiovascular imaging: referring providers, consultative specialists, technicians, cardiologist, and MMC imager. Additionally, the team should enlist the expertise of a quality improvement administrator who guides the group as it reviews specialty guidelines and decides on standards of care acceptable to all representatives. The MMC imager subsequently works with the imaging technicians and business administrators to ensure the care pathway is feasible within the institution. Once a care pathway is finalized, the electronic medical record team works to create order sets and automate the care pathway. The algorithm provides physicians with a peer-reviewed, evidence-based imaging guideline to ensure consistent care for patients. Once the pathway is created and a high volume of patients is engaged in the pathway, the MMC imager can determine outcomes, or the full set of health results, to measure for each patient with a specific diagnosis. Continuous collection of predetermined outcomes will help identify opportunities for improving the care pathway. An efficient care pathway will help enhance the Tier 2 outcomes that describe the process of recovery of each disease, including time to diagnostic tests and time to appropriate therapeutics. A standardized system that promotes collaboration of care will affect the Tier 3 outcomes that describe the long-term clinical and health status achieved by the patient. One of the current projects at Ochsner focuses on increasing patient engagement in an effort to improve outcomes and therefore the value of cardiovascular imaging. Usually, patients undergo exercise stress testing for evaluation of ischemia. If the test does not show ischemia, the patient and physician are reassured. However, the results of a stress test offer further information about the prognosis of the patient and an opportunity to prevent cardiovascular disease, a core priority of the National Quality Strategy. Studies have shown that a patient's exercise capacity, measured by metabolic equivalents (METs), is a powerful predictor of survival and risk of myocardial infarction.21 Informing a patient of his/her age-appropriate and gender-appropriate METs engages the patient and integrates the imaging test with his/her own health. In the Ochsner study, patients with stress tests negative for ischemia and those who do not attain their age- and gender-appropriate METs will be randomized to an intervention (educational video) or a control (standard of care) group. The educational video will explain the results of the exercise stress test and the American Heart Association recommendation for lifestyle changes to improve the test results.22 Both groups of patients will repeat a stress test in 8 weeks to reevaluate their exercise capacity and lifestyle changes. Ideally, we expect patient engagement to improve their Tier 3 outcomes that describe the long-term sustainability of health or the functional and clinical status achieved by the patient. Additionally, we saw the opportunity to create a care pathway for cardiovascular imaging to optimize utilization of TEE based on findings from our practice improvement project in which 56% of inappropriate studies led to clinical change. Endocarditis and stroke were the 2 diagnoses for which the AUC did not correlate with clinical change. With this knowledge, we created a clinical care pathway to guide optimal utilization of echocardiograms in patients with Staphylococcus aureus bacteremia (SAB), the most common etiology for infective endocarditis. A team of physicians from infectious disease, internal medicine, and critical care, as well as an MMC imager and a hospital quality specialist, reviewed all evidence-based guidelines for SAB and created a clinical care pathway. A pilot study is ongoing to ensure sensitivity of the pathway. Specific patient outcomes to be measured are listed within the tiers (Figure 2). The outcomes within each tier are mutually exclusive, improving the ability to show a change in outcomes. Implementation of the pathway within the electronic medical record will allow for measurement of outcomes and modification of the pathway to further improve outcomes and the value of echocardiography in diagnosing endocarditis. Outcomes measurement hierarchy for Staphylococcus aureus bacteremia. ICU, intensive care unit; TEE, transesophageal echocardiogram. Delivery of healthcare is shifting from a volume-based to a value-based approach. We need to be actively engaged in this transition and redefine ways to measure clinical outcomes. For optimal utilization of cardiovascular imaging, MMC imagers and referring providers must collaborate to create disease-specific clinical care pathways through a multidisciplinary team approach and to create innovative methods for patient engagement. CMS Quality Strategy 2016 Centers for Medicare & Medicaid Services. https://www.cms.gov/medicare/quality-initiatives-patient-assessment-instruments/qualityinitiativesgeninfo/downloads/cms-quality-strategy.pdf. Accessed June 28, 2016. The strategy that will fix health care. Harv Bus Rev. https://hbr.org/2013/10/the-strategy-that-will-fix-health-care. Published October 2013. Accessed June 26, 2016. The Cleveland Clinic Way: Lessons in Excellence from One of the World's Leading Health Care Organizations. Columbus, OH: McGraw-Hill Education; 2014: 151- 172. Health policy brief: patient engagement. Health Aff. http://www.healthaffairs.org/healthpolicybriefs/brief.php?brief_id=86. Published February 14, 2013. Accessed April 22, 2016. Patient Guide to a Stress Echocardiogram Test [video]. Ochsner Health System. https://www.youtube.com/watch?v=AjYMK3k_9ec. Published May 24, 2016. Accessed June 27, 2016. Measure Information Form: Heart Failure. Specifications Manual for Joint Commission National Quality Core Measures (2010B). https://manual.jointcommission.org/releases/Archive/TJC2010B1/MIF0029.html. Accessed May 15, 2016.